Gatti Automotive Offers Auto Repair Services You Can Count On! 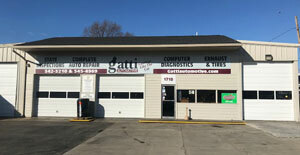 Since 2003, Gatti Automotive has provided motorists in the Roanoke, VA 24012 area with comprehensive auto repair services that include 4x4 Services, Brakes, Car & Truck Care, Domestic Cars & Trucks, Electrical Services, Electronic Services, Engine & Transmission, Engine Maintenance, General Services, Heating and Cooling Services, Import Cars & Trucks, Inspections and Emissions, Miscellaneous Services, Tires, Towing, Transmission Services and Undercar Services. Our goal is to offer the best services available at affordable prices to get you back on the road in no time. For a high-performing vehicle, trust Gatti Automotive with your car, truck, or van. To learn more about the services we offer, please contact us by phone at 540-345-4969 or send us an email. We also invite you to learn more about our dedication to you, our valued customer. These guys are great. Not only did they do a fantastic job on my truck, they had it done ahead of schedule. David is very professional and good at explaining what needs to be done and how much it will cost. He goes the extra mile to make sure you get great service. I highly recommend these guys to everybody I talk to and I will definitely be back. Very good service; they installed a new lower intake gasket on my Vortec 4.3 engined Blazer. Have used Gatti Automotive twice, and I've appreciated their quick turnaround service. The 1st time was when I had a frontend collision and punctured my radiator. After my car was delivered at lunchtime that day, they had replaced the radiator by closing time the same day! Great people.great work.honest people.reliable people.trustworthy people.will treat you riight when it comes to your vehicle.George is fantastic.Great human being. Great place to take your car! Also, a great place to buy a used car (One of George's "project" cars)! Comments: I've known Mr. Gatti for several years, and find him to be totally honest in his dealings with customers. For those who've checked other shops, it is rare to find a business with the honesty, dedication, and knowledge of Gatti Automotive. I've brought all my cars here, and I would not hesitate recommending this business to others. These guys are fantastic and reasonably priced! Very knowledgeable and have saved me a lot of money! Service center you can trust. Friendly people, work is always top notch. Brought in my car with a broken AC that no one else could fix locally, and on a time crunch, as I was moving in a few weeks. They were able to get me in quickly, assess the problem, and get my car back in with the parts, and a lasting fix, even under the time pressure I put on them. Staff were friendly, and very thorough in explaining what the problem was, and what they would do to fix it. Price estimates were accurate, and there were no unexpected costs. The inspection was done. Work had to be done. We were told what was needed and given very reasonable prices.The service was friendly. We have had our vehicle serviced here before.The service was friendly and well done.That is why we will return. Trust, capable, responsible, honest, friendly, fair prices all come to mind for all the service and diagnostic work I have had performed at Automotive Radiator. They stand behind their work and always try their best to do the right thing. They have solved some very difficult to diagnose issues. They are Keeping my Jeep safe, roadworthy and functioning for several years now. I took my car in for AC service after having problems for over a year that another garage could not locate. It was fixed right the first time and is now running properly. Staff was very friendly and took my car in the garage right on time. I am very pleased with the price of the repair which I did not think was excessive. Thanks to all at Automotive Radiator & AC for a good experience.